The mass media reform plan is preparing to push forward a media control law by the end of 2018, and appoint the nine members of the professional council to set media ethics standards, control media that do not wish to become members of any professional organisation, as well as increase measures to criminalize online and social media that disseminate content affecting security and the nation’s core institutions. In the National Reform Plan covering 11 areas embedded in the announcement in the Government Gazette and in effect since 6 April 2018, mass media becomes one more big issue that the NCPO government sees necessary to reform. The main reforms planned by the National Reform Committee on Mass Media and Information Technology under Jirachai Moonthongroy, former Permanent Secretary of the Prime Minister’s Office under the NCPO government, consist of six matters: to reform the people’s media literacy; to lay out approaches on promoting the professional ethics and standards of the media; to reform the structure of the mass media and information technology industries; to reform the approaches to online media control; to reform the administration of cyber security/space affairs and the systems and tools for mass communication and telecommunications to support disaster prevention and mitigation missions; and to reform the state sector’s news administration system. In laying out an approach to promote media professional ethics and standards, there are 4 targets: promoting the establishment of a national-level council of mass media entrepreneurs and academics for for self-regulation of entrepreneurs and professionals; supporting and promoting the development and enhancement of the potential of mass media personnel; supporting the creation of an ombudsman system for handling complaints and controlling professional standards and professional ethics at the level of organisations, professional groups and the national council by emphasising the participation of the people’s sector; and supporting the creation of a common manual of standards for professional media ethics. By the end of 2018, the operation plans had been set in the first two quarters of the year; to establish a drafting committee for the Mass Media Ethics and Profession Promotion Act B.E. ….., consisting of representatives from the Council of State, professional media organisations, media entrepreneurs, academics in communication arts and mass communication and the National Reform Committee on Mass Media and Information Technology. Later in the third quarter, from June to August, a draft bill will be submitted to the full Council of State for scrutiny, and then proposed to the Cabinet for approval in principle. Then in the last quarter of 2018, the bill will be proposed to the National Legislative Assembly (NLA) for consideration, and in 2019, after the Act comes into force, the Office of the Permanent Secretary of the Prime Minister's Office will act as the temporary administration to start the search for an executive committee and establish the office of the professional media council. As for the law’s core content, the version referred to above sets out a structure where the law will emphasise the development of a more efficient self-regulation system for the media profession in Thailand, while still maintaining the mass media’s principle of “autonomy” by professional organisations, but with a professional mass media organisation established by law with responsibility to control media that do not wish to become part of any professional organisation. Also, there are additional measures for stronger self-regulation, where mass media organisations of all fields will appoint a Media Ombudsman committee (to handle complaints on ethics inside the organisation), no matter if that mass media organisation is directly controlled by the established legal media professional organisation. Additionally, there are measures to penalize mass media organisations which do not comply with resolutions of the professional organisation they belong to, or the legally established professional media organisation, as the case may be. There will be measures to promote professional ethics and skills through training in various forms, with the legally established professional council promoting and supporting funds for professional organisations hosting the training sessions. In addition, they will promote and support the participation and awareness of the people in controlling mass media through training in media literacy. Mechanisms will be put in place to protect mass media professionals, in both the state and private sectors that comply with the professional ethics framework, from intervention by the state and other interest groups. The bill mandates a Mass Media Professional Council Committee, consisting of a Chairperson, 5 members selected from among mass media professionals and a qualified member appointed from each of the fields of communication arts, law, consumer protection and human rights, totalling 9 members. They will have the power and duty to set acceptable common standards of ethics; promote ethics in the mass media profession; promote the amalgamation and self-regulation of mass media organisations and mass media professional organisations at national and regional levels; consider complaints in cases of violation of the rights and freedoms of mass media professionals or in cases where mass media professionals violate ethics through the mass media organisation they belong to; either examine, warn, amend or modify any statement according to the advice of mass media professional organisations or act directly, as the case may be. 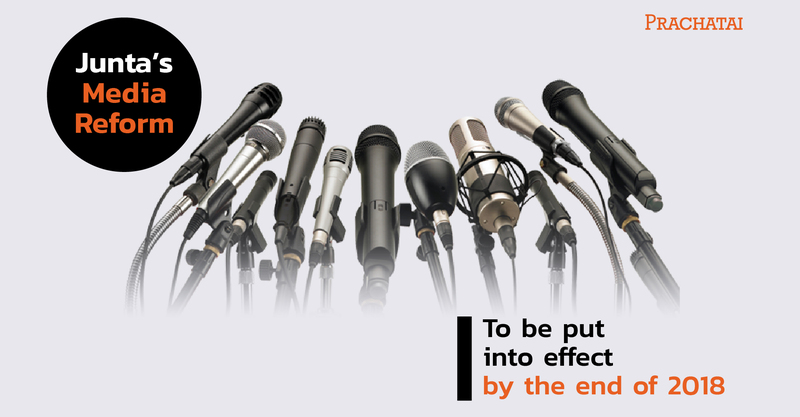 t is specified that there will be a Mass Media Ethics Committee, appointed by the Mass Media Professional Council Committee to consider complaints against mass media organisations that are not part of any professional organisation, before forwarding the complaints to the Mass Media Professional Council Committee for a decision. According to the principles stated in the media reform plan, there shall be 9 members of the Mass Media Professional Committee. The first 5 are appointed from among the following mass media professional organisation groups: the Thai Journalists Association; the News Broadcasting Council of Thailand; the Online News Providers Association; the National Press Council of Thailand; the Thai Broadcast Journalists Association; and the Local Mass Media Professional Association. Each group shall nominate 2 representatives; 1 must be a professional with an affiliated organisation, and the other freelancers. Then, a nomination committee will be established with 9 members consisting of deans, department heads or faculty/department representatives of communication arts or mass communication from 3 groups: public universities, Rajabhat universities and private universities, to be chosen among themselves. Each group will have 3 representatives, totalling 9 representatives. Their duty is to whittle down the list of names submitted by the various mass media professional organisations to just 5. The selection method for the 4 experts in communication arts, law, consumer protection and human rights has yet to be prescribed. The approach to controlling online media has a target to develop, promote and control the joint administration of cooperation networks in surveillance for unreliable data. The cooperation is between state agencies and the people’s sector, in accordance with the Civil State approach. Emphasis will be on information technology innovation to develop data checking systems, to protect the people’s online e-commerce and suppress cybercrime; to use information technology innovation for the integration of online danger warnings, complaints, investigating and preventing the dissemination of illegal data and messages, and for response and treatment systems for victims from online dangers, as well as to create mechanisms to coordinate cooperation with entrepreneurs in foreign countries to solve issues quickly and efficiently. By the end of 2020, it is hoped that a department or agency will be established serving as liaison with online media service providers both in and outside the country as the only Official Point of Contact, an agency implementing legal measures specifically for recovering civil damages in order to pressure foreign online media service providers by, for example, filing civil complaints in cases of the dissemination of content that affects national security and core national institutions that are non-negotiable, and a central data system to prevent the dissemination of inappropriate or illegal data. Amendment of the Revenue Code will be moved to cover tax collection of online foreign businesses that use a Content Delivery Network (CDN) system inside the country. There is also a proposal to amend the regulations and announcements of the Ministry of Digital Economy and Society to support the establishment of a central data system to suppress the dissemination of inappropriate or illegal data that affects security in all dimensions.